In the photo of the Miss Titche store, One Main Place (on left) is clear, but what is the taller building at right? 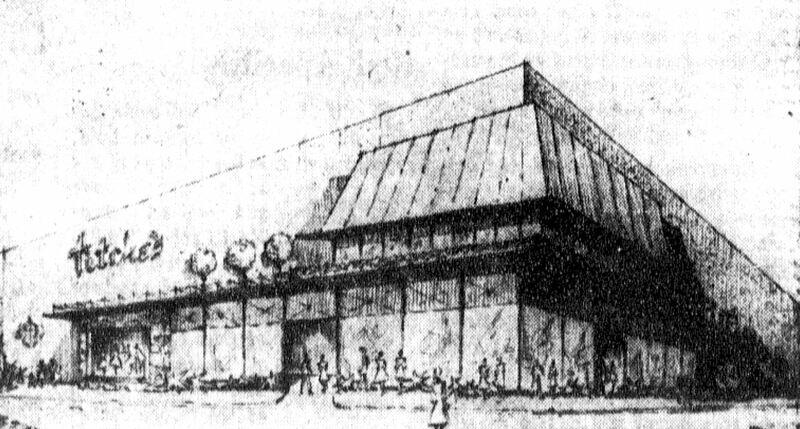 Was it a planned structure, never built? 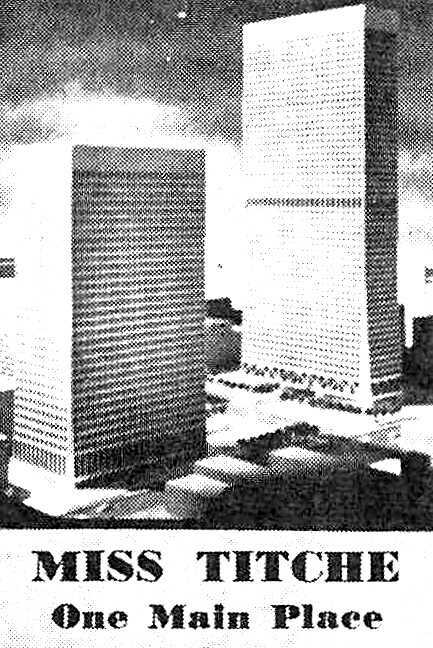 It’s a rendering — I know there was a planned “Two Main Place” and, I think, a third building, but the planned complex fizzled out fairly quickly. I well remember the grand opening of The Fair in Lochwood – very swanky store, great architecture inside and out. I was only six so it had to be snazzy to make an impression like that. 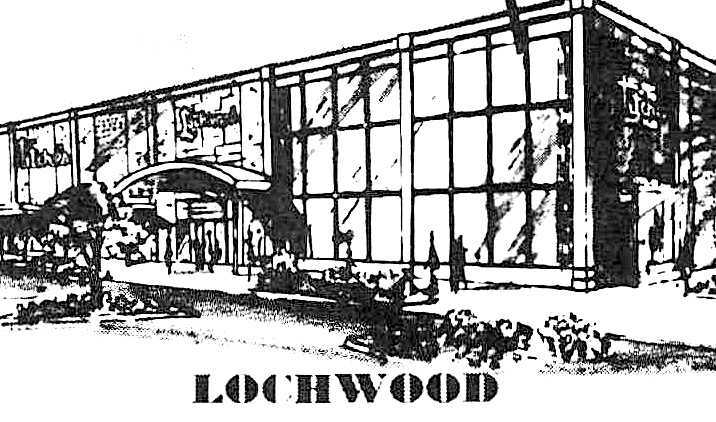 My family lived right across Lochwood Blvd. in the Lochwood Apartments. Great place for families in the late ’50s – early ’60s. And a little bit of Cowtown was right across the street. 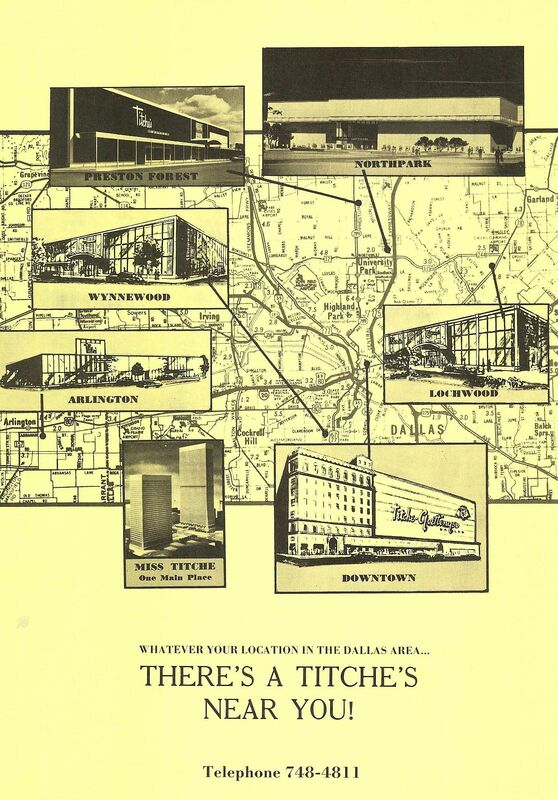 My grandmother worked at the Titches in Wynnewood in the 1960’s and early 70’s. You couldn’t walk in their for two minutes without being asked if you needed help. Downtown Dallas was one of my playgrounds in the 1940s. Titche’s had a”Toyland” store on Elm straight across from the Melba Theatre. The entrance was separate from the main store but I think there was an inside entrance. It was a wonderland of outdoor swing sets, seesaws, things to ride, etc. I played on the equipment often. No one seemed to mind. Then I would head across St. Paul to Skillern’s, entering down a concrete enclosed spiral staircase for a chocolate soda at their extremely long counter. I shopped at the One Main Place location several times from 1977-82. By then it was a Joske’s, but as a small store, carried only young women’s clothing. Was it on street level or in the underground tunnels? Some descriptions in ads make it sound like it was in an open-air, recessed area below street level. Did it become “Miss Joske”? I remember getting to it through the tunnels from First National Bank where I worked summers during college, so it was one of the tunnel level stores, along with other restaurants and shops back then. It was Joske’s when I shopped there and it may have had some sort of name designating it for young women only. The store stock was seasonal and not a huge selection as it was a very small store…they catered to young women working downtown and had mostly dresses, suits, and dress shoes, with one casual rack, too. I loved it because the prices were better there than in the big store. Thanks, Teresa. That whole tunnel system still seems pretty weird to me! I think Brennan’s restaurant in One Main Place also had a tunnel entrance! I believe the One Main Place store was used as Pam Ewing’s place of employment on early seasons of Dallas. I have a dim memory of Victoria Principal and Patrick Duffy riding the escalator from “The Store” (that’s what it was called on the show) up to street level and she hops into her Mercedes convertible parked right in front (yeah, uh huh) and drives off. Ewing Oil was supposed to be in InterFirst Two, across the street from The Store, even though you could see InterFirst Two and the rest of downtown from Bobby’s office window where the Ewing Oil interiors were being shot, at 3131 Cedar Springs. Thanks, Erich! I love this kind of trivia! Late 70’s and early 80’s worked in the Corp HR dept. Wynnewood and Lockwood was gone by then. Very aware of the Fair Acquisitions from Fort Worth, (my mother modeled clothes in their advertising dept in the 40’s)– The Fair was sorta high end similar to Striplings. Titche’s patterned themselves close in merchandising and product as the Sanger Brothers stores. Since the depression 1929 the opening of the current downtown location, Main Elm & St.Paul, Edward Titche sold out to Allied Stores of NYC very quickly and retired. Allied kept the name Titche’s until the Name Joske’s was chosen to bring all the stores in Texas under the same name in the very early 80’s. Joske’s was headquartered in San Antonio near the Alamo. Prestonwood was added in the early 80’s in Prestonwood Mall along with Richardson Square Mall. Northpark was always the flagship store for revenue, (not downtown). Arlington store, was sliding in sales with the building of Six Flags Mall (early 70’s) now demolished 2017. 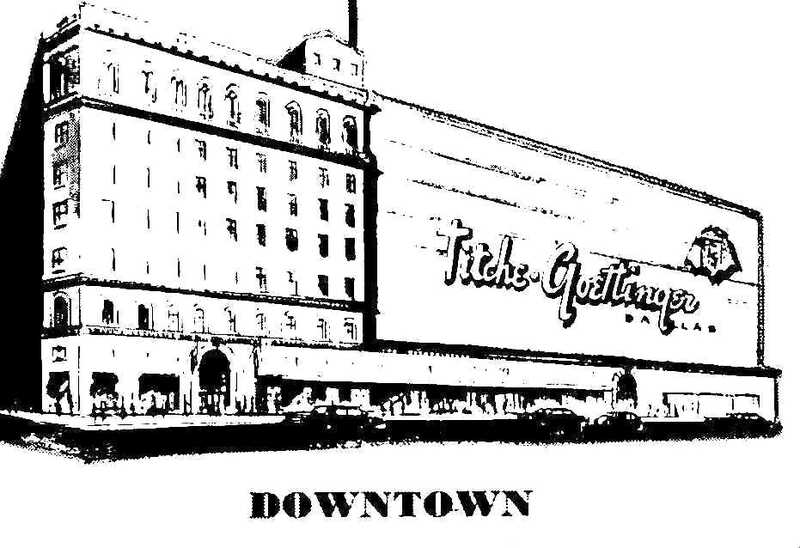 Titche – Goettinger stores were originally dry goods stores and moved several times in downtown Dallas in their early history. Later they became a moderate to high-end store especially in soft goods and fashion, but did not appeal to the upper price scale marketing targeted by Neiman Marcus. 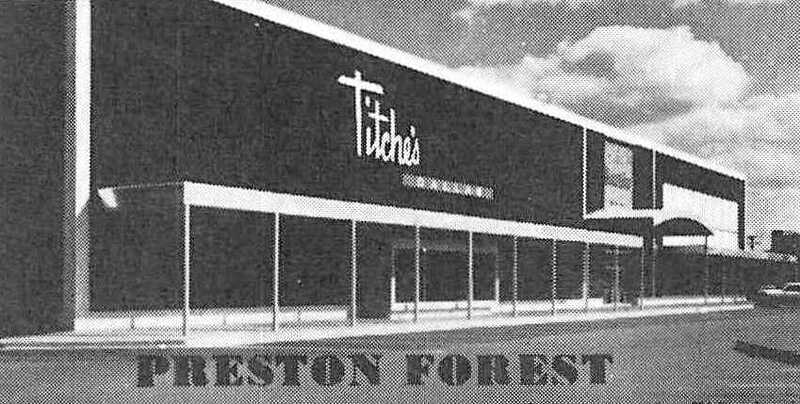 The downtown store had fashion shows in the auditorium on the top floor, and the restaurant, had a piano player and a indoor forest motif in the 50’s 60’s. The downtown store, now apartments, has great historic images of the store in the 30’s and 40’s in it’s lobby They are worth visiting. 1901 Elm Street Dallas, Texas.